Brooklyn-based quartet French Camp recently released its self-titled debut album, a collection of tunes that pull inspiration from some of my favorite genres and styles. This means, of course, that I love every song for different reasons, but there is one prevailing technique carried through the record that cements my regard and respect for the music and the band. We get a taste of some British Invasion, psychedelic rock, funk, and even a jam band here and there. That seems like it might be a slapdash collection, but that couldn’t be further from the truth. This is a well-crafted album in all respects, but even that doesn’t touch on what makes it truly great. 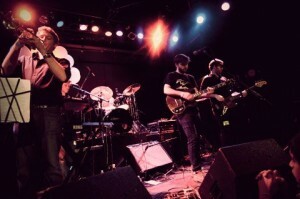 What really sets the whole band apart from other indie rock outings is their complete control and command of dynamics. Low, intense passages give way to free-falling musical abandon. Every single song will draw you in, twist you around, and leave you craving another ride, and all through the use of dynamics. Front man Owen Beverly demonstrates considerable skill as a vocalist, embracing imperfection and using his particular style to inject emotion that reaches right down to the core of the listener. At one point, he’s breathy and beguiling, and the next he gives everything in plaintive, wildly attractive full voice. His range is enviable, both vocally and intellectually. The instrumentation is clever, with the expected percussion, guitars, and keys, but then there are horns, organ, and synth tossed in here and there to great advantage. My standout tracks include Death Ray, which nudges my love for Pink Floyd; Dowry, the most excellent example of intensity and dynamic on the album; Glad, a driving tune featuring some fun percussion, the aforementioned horn section, and Beverly’s freewheeling vocals; and Attack, which starts with laid-back funk, moves quickly into the dramatic, and then settles right back into the relaxed vibe from the opening. If you’re a fan of The Shins, Arcade Fire, Grizzly Bear, or Band of Horses, you should definitely give French Camp a listen. You can buy the album on iTunes or the band’s website. Visit their Facebook page to listen to a few samples if you need proof before you buy. Thank you so much for the glowing review!